Where are USA Pears grown? The pears I find in the grocery store are hard and green. Why? What is the nutritional value of pears? Why aren’t the pears on display at the grocer as ripe as the ones you give as samples at your events? How can I keep cut pears from browning? How do you freeze pears? What are other good uses for pears besides eating them fresh or in salads? What do I do with my pears when I get them home? Q: Where are USA Pears grown? A: USA Pears are grown in Oregon and Washington where the right mix of volcanic soil, clean mountain water and warm spring and summer days, with cool nights, combine to produce some of the world’s finest pears. Oregon and Washington produce 84% of the nation’s fresh pear crop. Only pears grown in Oregon and Washington are sold under the USA Pears label. Q: The pears I find in the grocery store are hard and green. Why? A:Pears are a unique fruit in that they ripen best off the tree. As such pears are transported when they’re fully mature, but not always ripe. This assures that pears you buy are in good condition to properly ripen them at home after you buy them. Q: What is the nutritional value of pears? A: Pears are an excellent source of dietary fiber (a medium sized pear has 6 grams of fiber, 24% of the recommended daily allowance) and a good source of vitamin C, a proven antioxidant. Pears also offer potassium (a medium sized pear has 190 mg of potassium, which is 5% of the recommended daily allowance). They contain no saturated fat, sodium, or cholesterol. A medium pear has about 100 calories. Check out our Pear Nutrition section for complete pear nutrition values and explanations on the various nutrients found in pears. Q: Why aren’t the pears on display at the grocer as ripe as the ones I sample at your special events? A: The pears for sampling were ripened ahead of time so that we can show people how the fruit tastes when it has been properly ripened. Grocery stores often keep less ripe fruit on display so that they can keep them for several days without the fruit getting overripe. Your pears at home can taste the same if you simply allow them to ripen to perfection by leaving them at room temperature in your own kitchen! Q: How can I keep cut pears from browning? A: Browning, or oxidation, is a natural process that occurs when cut pears are exposed to oxygen. This can be slowed by “acidulating” the cut surfaces with a mild solution of 50% water and 50% lemon juice, which can either be brushed on or dipped in. Although this process won’t completely stop the browning of your pear, it will provide you with a little extra time to enjoy your delicious fruit. We suggest your cut pear be used as quickly as practical. Lightly poaching pears will also slow the browning and is a good way to prepare pears for use in salads. You can also use natural anti-browning products such as NatureSeal, which will slow down browning for over a week. Q: How do you freeze pears? A: We don’t recommend freezing fresh pears that have not been processed. The juice and fibers will separate in the thawing process, and the results are not at all desired. However, freezing a cooked or processed pear (such as pear sauce) to which sugar has been added will work. Pear pie fillings can also be pre-baked and frozen. Make sure the pears are in a tightly sealed container prior to freezing to help reduce freezer burn. Q: What are other good uses for pears besides eating them fresh or in salads? A: Pears are very versatile. In addition to being served raw in almost anything, pears bake, poach, sauté, roast and grill very nicely. They can be used as an ingredient in baked goods, and can be made into preserves, jams and chutneys. Anything that can be done with an apple can be done with a pear! Q: What do I do with my pears when I get them home? A: If the pears are ripe (see ripening information below), they can be utilized right away or refrigerated to slow further ripening. If they need to be ripened, the one thing you need to do is leave them at room temperature. Some people place them in a paper bag to help them ripen faster. Be sure to check them daily so they don’t get overripe. You can also arrange them in a fruit bowl and place them on the kitchen counter, dining room table, or even in the living room so you can enjoy their beauty as they ripen. Did you ever notice that realtors love to use decorative bowls of pears in homes they’re trying to sell? They’re beautiful! A: Since every climate is unique, the best horticultural advice comes from local sources. We suggest you contact your County Extension Agent or a local nursery for advice on your backyard pear trees. You can find your local extension office online at http://www.csrees.usda.gov/Extension/. How do I know when a pear is ripe and ready to eat? 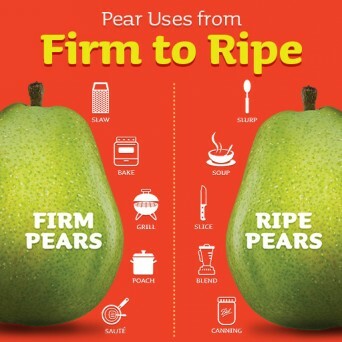 How do you ripen pears? What is the fastest way to ripen them? Why don’t my pears turn from Green to Yellow? I left some on the counter and they never got ripe…. they just turned rotten? How long will pears keep in the fridge? What are some uses for overripe pears so that I don’t waste them? Q: How do I know when a pear is ripe and ready to eat? A: Pears do not ripen well on trees. They are harvested when they are mature but unripe and need to be ripened after harvest. Bartlett pears change from green to yellow as they ripen. Non-Bartlett pears (Anjou, Bosc, Comice, Concorde, Seckel and Forelle) do not dramatically change color as they ripen. Because pears ripen from the inside out, the best way to check for ripeness is to “check the neck.” To do this, gently press near the stem with your thumb. When it gives to gentle pressure it is ripe, juicy, and ready to eat. If you wait until the pear is soft around the middle, then it will be overripe. Q: How do you ripen pears? What is the fastest way to ripen them? A: Pears need to ripen at room temperature, so leave them on the kitchen counter or on the dining room table to enjoy their beauty as they ripen. Placing pears in a paper bag will help them ripen faster. Be sure to check them daily so they don’t get overripe. Add apples or bananas to speed up the process, as ripening fruit naturally gives off ethylene, so more ethylene in the air around the pear will help speed ripening. Place ripe pears in the refrigerator to slow further ripening. Q: Why don’t my pears turn from Green to Yellow? I left some on the counter and they never got ripe…. they just turned rotten? A: You probably had Anjou pears which don’t dramatically change color as they ripen. Bartlett pears change from green to yellow indicating when they are ready to eat. But Non-Bartlett varieties such as Anjou pears will keep their basic color as they ripen. The best way to check for ripeness is to “check the neck for ripeness”. To do this, gently press near the stem with your thumb. When it gives to gentle pressure it is ripe, juicy and ready to eat. If you wait until the pear is soft around the middle chances are it will be overripe. Q: How long will pears keep in the fridge? A: Once they are ripened, pears will generally keep in the refrigerator for 3 to 5 days. Unripe fruit can generally be kept for a week or more, however, pears will not ripen properly inside the fridge. Q: What are some uses for overripe pears so that I don’t waste them? A: Overripe pears are still delicious, just not ideal for serving whole or sliced. Use them in smoothies, sauces or as a tasty thickening agent for soups, stocks or stews. Are the red pears different from green pears and do they have different flavors? Do all of the pears have different flavors? I thought they all taste the same. Which is the best pear for cooking? Which is the sweetest pear? Why are some pears brown or have brown spots? Q: Are the red pears different from green pears and do they have different flavors? A: Red pears are a natural variation developed from their green counterpart. Generally the red pears will taste very similar to their green counterpart. For example, a red Bartlett will be similar in taste to a green Bartlett pear, and a red Anjou will taste similar to green Anjou. Pear flavor does change subtly from variety to variety. Do a side-by-side taste test and you’ll see! Q: Do all of the pears have different flavors? I thought they all taste the same. Q: Which pear is best for cooking? A: Firmer varieties such as Bosc, Anjou, or Concorde are best for heated applications like poaching, baking, and grilling. Because their flesh is denser, they hold their shape better, and their flavor is not overpowered by the flavors of other cooking ingredients. If a recipe calls for a certain variety of pear, we suggest you use the variety suggested. The pears that are NOT optimal for heated applications are Bartlett, Red Bartlett, Starkrimson, and Comice, as their flavor and texture are at their peak when ripe and fresh. Their consistency may over-soften and their flavor may diminish when heated. Q: Which is the sweetest pear? A: All pears are sweet, each in their own subtle way. Many people consider Comice and Seckel to have a rich sweetness to them. Anjou is more of a clean sweetness, and Bosc has a honey sweetness. Be sure to ripen the pears before eating – this allows the sugars to develop in the pear to their sweetest and juiciest best. Q: Why are some pears brown or have brown spots? A: Several varieties are naturally brown or have spots called russeting. It is normal and naturally occurring for the variety. You don’t need to peel the skin on russeted pears – take a bite and you’ll see that the flavor is fantastic. You cannot judge a pear by its color, as most don’t change color as they ripen and the russeted varieties are just as sweet as their red, yellow, and green counterparts.